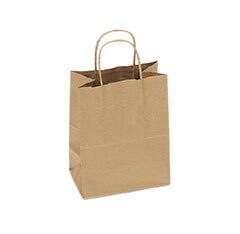 Stock Unprinted Kraft Bags - Rush Delivery! What is recycled Kraft paper? Recycled Kraft paper is a mixture of post-consumer waste (from corrugated cartons) and post-industrial/pre-consumer waste. It is biodegradable, compostable, and readily recyclable. By buying recycled products, like recycled Kraft paper, we help increase the demand for recycled material, which increases the rate of recyclability. This is what is meant by "closing the loop" in recycling. Recycled paper products are in high demand because of the growing awareness surrounding the movement towards sustainability in today's marketplace. Modern Arts Packaging Inc. recognizes this and has made it a top-priority goal to help retailers provide an environmentally-conscious “green&rrdquo; customer-carry solution. Consumers are concerned about the environment and want to make the right choice for the environment. 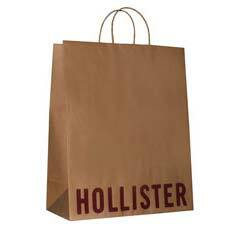 They also want a bag that is easy to carry and strong enough to hold their purchases. 100% Recycled Paper, made from 100% Post Consumer fiber content. This bag also helps with source reduction at the checkout counter with its ability to hold more items and allow for easier loading. Wide, stand up handles with long adhesive strips provide additional strength. Our 100% Recycled Paper Handle Bag was the first grocery bag on the market that was manufactured with 100% Post consumer recycled fiber.